Gilligan at the 2013 San Diego Comic-Con. George Vincent "Vince" Gilligan Jr. (born February 10, 1967) is an American television Writer, producer and director. He is best known for creating the AMC drama series Breaking Bad (2008–2013) and its spin-off Better Call Saul (2015–present). He also wrote and produced for the science fiction series The X-Files and was one of the creators of its spin-off The Lone Gunmen (2001). Gilligan was born in Richmond, Virginia. He has been with his girlfriend, Holly Rice, since 1991. He is an agnostic. ↑ Segal, David (July 6, 2011). "The Dark Art of 'Breaking Bad'". The New York Times. Retrieved July 22, 2018. 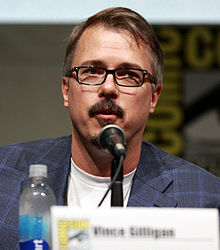 Wikimedia Commons has media related to Vince Gilligan.